The biggest news story this month is the headline 'Slade Moving To America'. This is not completely true, Slade have no intentions of leaving Britain permanently. They are shortly undertaking a global Tour which will keep them outside England for an extended period. There are two reasons necessitating such a Tour, first the need to conquer America, for although they have been successful on tour there they have not experienced such record sales as enjoyed in Britain, and to consolidate their success throughout the rest of the world. Secondly, the crippling taxes they have to pay are forcing them to spend a large portion of each year outside England. Let the boys explain for themselves - see further on. At the time of writing, Slade are at No.2 in the singles charts with 'Thanks For The Memory' (It's their Best Melody Maker) and has sold 200,000 in only two weeks. Strange things are happening on the Album front, 'Play It Loud' released in 1970 has been outselling any other of the Slade's releases over the last month. Once again we have the continuing article by Dave about guitar playing. Dave has produced so much that I think it will run for at least six issues of the newsletter with the 4th, 5th & 6th issues actually playing Slade songs. If you need more copies of the fan club offers leaflet, them please send a stamped addressed envelope marked 'Offers Leaflet' and I will send you one as soon as possible. Copies of the Slade 75 Tour Programme are available to Fan Club members, but hurry as I have only 400 left. They cost 40p including postage and packing. For those who have difficulty in obtaining the Slade In 'Flame' poster magazine, I have a few copies left. They are 30p and 6p postage and packing. Please identify clearly the item you are ordering when sending in your money. (Cheques and Postal Orders should be made payable to 'Slade Fan Club'). Overseas members please add on 10p. The Management of the New Victoria Theatre, London, were clearly expecting the worst. A clump of policemen stood outside, and inside a group of alert looking men in dinner jackets. It is now nearly four years since Slade became the adulation of Britain's teenagers. 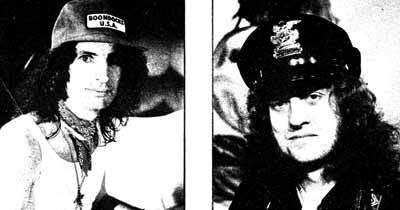 In a sense, Slade should belong to the past, belonging to a time when a band succeeded on energy and musical ability. At their worst, Slade are good. At the New Victoria they were excellent and there was evidence that something more had developed. Their sound reproduction was first class - every word and every note could be heard at any point in the hall. The swirling light effects add a touch of glamour to an already glittering night. Much is owed to Noddy Holder who provided the scream in Slade's music and the touch of the Artful Dodger, not at all displeasing. Musically, where do they stand now? They have made a dozen excellent pop singles, which is a great deal harder than making bad pop records. During the Rock & Roll numbers, Noddy's voice booms out with his usual raucousness, but with 'How Does It Feel', 'Everyday', and 'Far Far Away', Noddy moderated his voice very successfully. The music from the show was original and thoroughly enjoyable. They possess one other commodity, which is in short supply in the music industry - a sense of humour! Bunny originally toured Scandinavia, Germany and France with Slade last December. 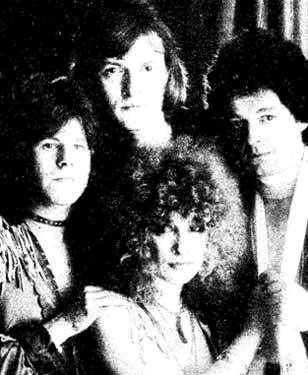 As well as for the last British tour, after their discovery by manager Henri Henriod at the famous Thomas A' Beckett pub in the Old Kent Road, London, their career was given a boost when Chas Chandler was impressed enough to choose them as the first group he'd personally record since Slade. On June 6th. following their tour as support to Slade, they'll see their debut single, self penned 'Baby you are getting to Me' on release by Polydor. Based in Liverpool, they are Linda Millington (lead vocals), songwriter Kenneth Parry (lead guitar), Gordon Dover (Lead bass) and Terry McCusker (Drums). New album due in the Autumn recorded live at the New Victoria, London. More news to follow in the next Newsletter ... Advance congratulation to Charlie the Sound Mixer, on his marriage in August. I've just heard the other roadies say they will drive him to the church in the Group's articulated equipment lorry ... American Tour to start mid July in Central Park, New York ... 'How Does It Feel' in the Top Ten of most European countries ... Slade's debut film will be released in America in the Autumn but under the name of just 'Flame' ... Because of the lack of future live performances in England, Independant Television is negotiating a Slade T. V. Spectacular. After I wrote my notes last time, which were all about how to look after your guitar, I realised that some of you probably haven't even got one yet but are still saving up. So I thought that maybe I ought to pass on a few tips about buying your first guitar before getting down to the serious business of playing. There are two things to keep in mind when choosing a guitar. First of all, how much you can afford to spend and secondly, what style you want to play. Even if you eventually want to be lead guitarist in a band, it's better to learn your first chords on an accoustic guitar and transfer your knowledge to an electric one at a later date, like I did. There are plenty of good accoustic guitars on the market for around the £40 mark. If this seems an impossible sum, you should be able to pick up a secondhand one for much less. My first one cost about £12! When you're actually going out to look at guitars with a view to buying one, do try to take a mate along who knows something about them. Here are a few things you've got to watch out for. First of all check the guitar all over to make sure there are no cracks, screws missing, anything obviously wrong. Next twiddle the machine heads to make sure they're not sticking or jamming. Thirdly, most important, hold the guitar up with the neck towards you and squint down the length of it. If any of the frets seem raised higher than the others, the neck is probably warped and it's not worth buying, because a warped neck makes the strings go out of tune. If you just want to use the guitar to sing to yourself or a few friends, a Spanish guitar, which need not necessarily be made in Spain but which is the general name given to nylon-strung classical guitars, will be just what you need. Nylon strings are also easier on your fingers. If, however, you have ambitions to end up singing in clubs, a larger guitar with steel strings is what you need, because it has abrighter sound that carries further. Whichever type you buy, try holding down the strings with the fingers of your left hand, especially on the higher frets near the body of the guitar. If they seem so high above the fingerboard of the guitar that it's a great strain to hold them down, that means the action is too high and you should find a guitar where the strings lie closer to the neck. Ask if the guitar has an adjustable bridge. If it has, high action is a thing which can be corrected. If not, don't buy it. Assuming you have a guitar now, on to your first three chords! I believe in learning chords as soon as possible because that makes finding out about the instrument much more interesting. If you can accompany a song straight away, no matter how slowly, it's far better than the sort of music lesson I remember from school, where you had to do dreary old scales for hours on end before the teacher would let you learn a tune! These symbols need a bit of explaining. 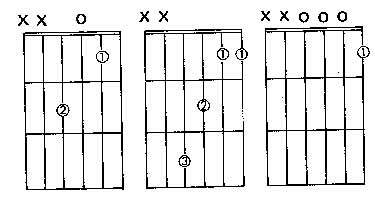 They represent the first three frets on the guitar, the double line at the top representing what's called the 'nut', the white bar that the strings are stretched over before they reach the first fret. The six vertical lines are, of course, your guitar strings. The 'X' represent strings which must not be strummed, because these are simplified chords which only use four strings of the guitar, and the '0' denotes a string which is to be strummed but has no finger of your left, chord-playing hand holding it down! Got it? You don't count your thumb as a finger, so your index finger is 1, your middle finger 2, your next finger 3, and your little finger 4. I've put the names of the chords underneath the symbols, so you'll know what your playing. The reason why I've given you three chords is that the basis of all the good old rock and roll songs like Good Golly Miss Molly, Johnny B. Good, Roll Over Beethoven, is three chords. And I've chosen the key of C because it's an easy one to sing in. Place your fingers on the strings as indicated, then strum with your right hand in a downward motion, away from you, carefully avoiding those strings marked with an X If you hear a buzzing or rattling sound, it's probably because you're not holding down the strings hard enough. Practise each chord at a time, till it starts to sound clear, then go on to the next one. Have a rest if you get tired or your fingers start hurting. That old muscle power will soon build up! At first you'll only be able to change from one chord to another very slowly, but that will soon speed up with practise. By the way, on that chord of F Major, where two strings are held by your first finger, all you need to do is bend the top joint of your finger over the neck of the guitar so that it covers both of them. As soon as you've worked up enough speed to manage four strums on each chord and a smooth changeover to the next, try playing them in this order. C (8 strums), F (4 strums), C again (8 strums), F (4 strums), C (2 strums), G7 (2 strums) and finally end up with a strum on C. You'll find you can sing the whole of 'Michael Row The Boat Ashore' to these chords. And you'll probably find some more songs you fit to these chords, too! An onion keeps everyone away. The doctor has got to keep away. Wham Bam Thank you Mam, Thanks for the ball. If only there's nothing else to do. The doctor has got to earn his pay. He'll tell you, Thanks for the Memory. © Copyright 1975 by BARN PUBLISHING LTD .
Hello, this is Jimmy here. I'd like to thank you all for coming to see us over the years. We've done 6 tours of Britain and enjoyed everyone, it's always best to tour in Britain. We're going to America because we feel it's time to get some success there, we will not be touring for another year or so, but we will be coming back to England in our spare time, so we will not be disappearing altogether'. 'This is Don speaking. There is not much I can add to what the others have said. But I would jus: like to say thanks to all the fans who have followed us over the last four years, and supported us all along the way - thanks. See you soon'. Dave here, hope you are alright. Hope you enjoyed the movie and remember for all those girls who were crying at the end, it's only a film and it ain't true about Nod and Jim, they are good friends really. May have our T,'v', series soon, hope you all like the new single 'Thanks For The Memory' and keep smiling, Ta Ta!